Photography is a hobby that many people enjoy. I enjoy photography but I am not particularly good at it and I’m rather lazy about it. I don’t want to carry around a separate high quality digital camera and attachments when my smart phone that I always carry with me already has a camera and is much more convenient. A good quality digital camera can also be very expensive. Luckily for me and other semi-serious photographers there is a pretty cool gadget that allows you to make your smart phone camera a bit fancier. I’m talking about external lenses that you can attach to your phone. Photos taken with external phone lenses. Top row: Dandelion with bug, pinecone, and dog nose all taken with Photojojo macro lens. Bottom row: Dog and cat taken with Olloclip telephoto lens; walking path through trees taken with Photojojo super fisheye lens. I have an iPhone 5S and I own two different brands of phone lenses. The first one I bought was a 2x telephoto + circular polarizing from Olloclip. Later I bought a kit from Photojojo that contains a 2x telephoto, a macro + wide angle, a fisheye, a “super” fisheye and a polarizing lens. Below is a description of these two brands along with their pros and cons. This is followed by examples of photography with the different lens types. Olloclip lenses slip over the corner of your phone, which allows them to be easily positioned correctly over the phone camera. They make a 2x telephoto + circular polarizing combination, a 10x macro + fisheye + wide angle combination, and a 10x macro + 15x macro + fisheye + wide angle combination. By slipping over the corner of the phone, they are easy to position properly. They work really well and do not allow any light leakage. They are available to buy online or at certain brick and mortar stores including Apple stores, Best Buy and Target. Olloclip lenses are fairly expensive. My 2x telephoto + circular polarizing lens cost $99.99. If you have protective film over your phone screen, you have to be careful attaching the lens because it can catch on the film and peel back the corner. They do not work well with an ordinary protective phone case. You have to take the case off to use them. 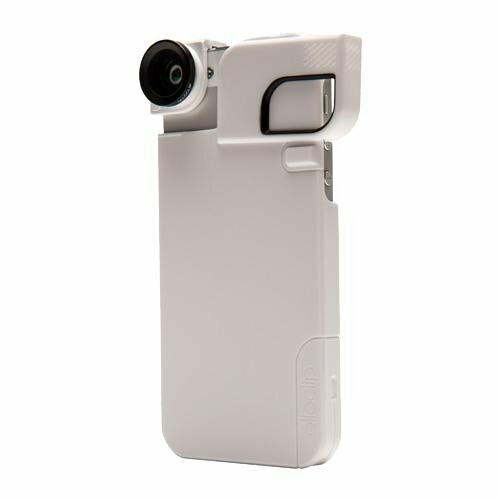 Olloclip sells a phone case with a corner piece that flips open allowing you attach the lenses without removing the case. I have one of these and it works really well, however it is fairly expensive at a price of $39.99 and is currently only available for the iPhone 4/4S and iPhone 5/5S. They do not work with all phones. There are only lenses for the iPhone 4/4S, iPhone 5/5S, iPhone 5C, iPhone 6/6 Plus, iPad Air, iPad Mini, Samsung Galaxy S4 and Samsung Galaxy S5. 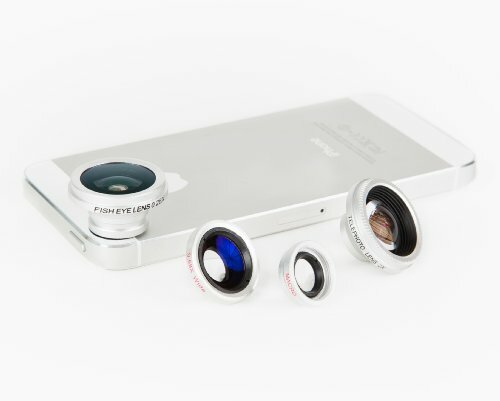 Photojojo lenses attach to the phone magnetically. They come with flat metal rings that have adhesive on one side that you attach to your phone. The lenses have a magnetic ring that connects to the ring on the phone. I found this company when I wanted to get a phone lens as a gift for someone before Olloclip had created one for the iPhone 5C. Photojojo sells each lens individually or kits containing a 2x telephoto, a macro + wide angle, a fisheye, a “super” fisheye and a polarizing lens. They are very inexpensive compared with Olloclip lenses. Each lens costs $20 or you can buy them all for $99. Photojojo lenses work with almost every smart phone. Because they attach with a magnetic ring, the shape of the phone does not really matter. They work well; however, you have to get them positioned just right on the magnetic ring to get the best picture. Sometimes there is darkness or blurriness around the perimeter of the photo but this is easily cropped out. Photojojo is a hip and fun company that sells lots of other gadgets to help you with what they call “phoneography.” My order arrived with a small toy dinosaur included. While the adhesive metal ring worked well on the iPhone 5C, I found that the ring did not stick to my iPhone 5S. I attached it with super glue and it stayed on for about a year. I have also supported the adhesive ring with a piece of clear box tape over the top and it worked just fine. The company seems to have addressed this problem because now they include a larger adhesive plate for the iPhones. The lenses come with multiple rings so you can replace them as needed. The lenses may not work with your protective phone case if the opening for the camera is not large enough. A little bit of phone case modification may be necessary. They work well with the Olloclip flip case described earlier. Following are some very basic descriptions of the various types of external phone lenses along with photos in which they were used. Most phone cameras have a digital zoom feature. This makes it seem like you are zooming in on the object that you are photographing. In reality your phone is enlarging the area of interest, cropping the other areas out and using interpolation to improve the quality. The Olloclip and Photojojo external telephoto attachments provide optical zoom. This means the object is magnified before the image is captured, which results in a better quality image than one using digital zoom. Using a combination of the phone’s digital zoom and the external optical zoom lens can produce a pretty impressive image for a phone camera. Comparison of Photojojo and Olloclip 2x telephoto lenses. Top (left to right): No lens, Photojojo telephoto, Olloclip telephoto. Bottom (left to right): No lens with full digital zoom, Photojojo telephoto with full digital zoom, Olloclip telephoto with full digital zoom. The Olloclip and Photojojo polarizing lenses allow you to change the way light affects your photo. A polarizing lens can be used to prevent reflections in photographs of water or windows. It can change the color of the sky and enhance the color and crispness of things like foliage, water, or clouds. A different look can be achieved by rotating the lens to varying degrees. Comparison of Olloclip and Photojojo polarizing lenses. Notice there is very little difference between the two brands. Top left: No lens, Top center and right: Olloclip lens with varying rotation. Bottom left: No lens, Bottom center and right: Photojojo lens with varying rotation. A macro lens allows you to focus extremely closely on an object. This makes it possible to photograph very tiny things or to see greater detail on a small area of a large object. Left: No lens, closest position that is still in focus. Right: Photojojo macro lens. A wide angle lens allows more area to be included in a photograph than would normally be possible. This is especially useful when photographing landscapes or buildings that you cannot get far enough away from without obstruction. A wide angle lens can be used to emphasize a nearby object because objects that are farther away will appear much smaller. Left: No lens, no digital zoom. Right: Photojojo wide angle lens, no digital zoom. A fisheye lens is an extreme wide angle lens. When the horizon is focused in the center of the image, a landscape photo can be taken with very little distortion. When the horizon or objects are near the periphery of the frame they become distorted, which can result in some unique images. A fisheye lens is good for things like pictures of the sky or a large ceiling. Left: No lens, no digital zoom. Right: Photojojo super fisheye lens, no digital zoom. Both the Olloclip and Photojojo lenses improve the capabilities of the smart phone camera. So which brand is the best? 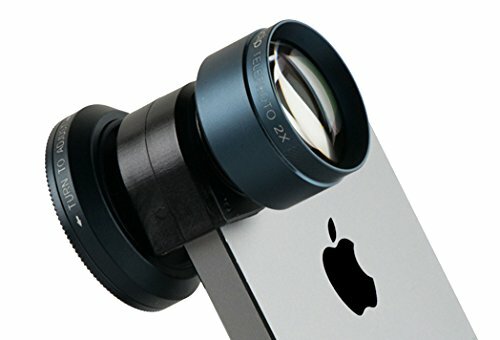 The Olloclip telephoto lens is clearly superior to the Photojojo telephoto lens so it is likely that the same is true for the other types of lenses. But the Photojojo lenses work pretty well and are much less expensive than the Olloclip lenses. You can get every type of Photojojo lens for the price of one Olloclip telephoto lens. And the Photojojo lenses work with nearly every smart phone, while the Olloclip lenses are more limited and lag behind the release of each new phone. For these reasons, I have to say that I lean toward the Photojojo brand. But as an owner of both brands of telephoto lenses, I will always choose the Olloclip lens for these types of photos because of its superior quality. Shooting star flower photographed with Photojojo macro attachment. These lenses are quite interesting. The photos look a bit grainy. Good article though.